The atmosphere during the Christmas season is festive, filled with lots of love and well wishers. So getting married during this special time of year will add another level of love and excitement to your marriage. After you have notified your close family and friends about your upcoming marriage and selected your date, venue for your ceremony and reception, it's time to think about your theme for your "Save the Date Cards" and invitations. What are some of your options for your "Save the Date Cards" and invitations? You can create a winter wonderland effect using snowflakes, snowmen, and a winter scene. 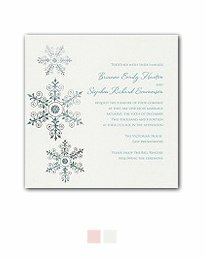 The above sparkling snowflake invitation is printed on a shimmering pearl cardstock. 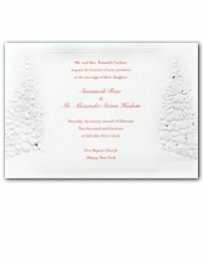 Bring in your Christmas nuptials with this exquisite fold-over invitation adorned with a winter theme motif accented in shimmery silver. 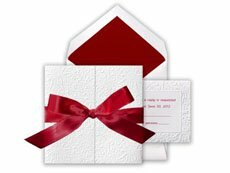 If you can't find a Christmas wedding theme invitation consider choosing a white or ecru invite and use red or green ink for the lettering and a red or green inside flap on the envelope. 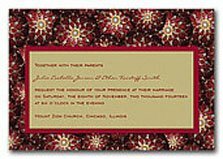 This lovely square invitation is embossed with flowers. 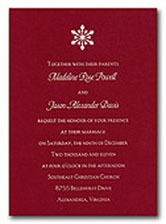 The red ribbon, lettering and envelop flap has just the right amount of color to herald in your Christmas extravaganza. Check out your local card stores, the Internet and Staples to find inspiration for your invites. With the above red invitation, snow seems to be accumulating before your eyes. 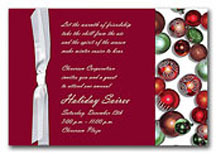 The tiny snowflakes with small red accents create a magical design for your Christmas invites. 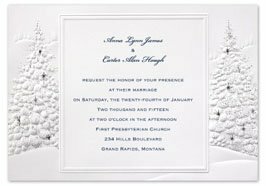 This beautiful decorative snowflake design with a sprinkle of snow will let your guests know that your wedding will be an enchanted evening. The design will be printed in the same color ink as your wording. 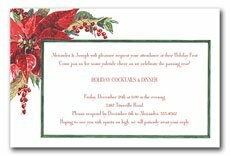 You can take any Christmas Invitation whether it be an invite to a holiday party, house warming or office party and convert it to a wedding invite. Remember your invite sets the tone for your wedding, so if you just can't seem to find an invite that fits your style – create your own using your imagination, computer and photo shop to bring your ideas onto paper. Consider using silver and white with crystal accents to make a glamorous, opulent invite. Martha Stewart, recommends sending out invites six to eight weeks before your marriage will allow your guests adequate time to respond and ensure that you will receive a reliable head count. Most people and businesses, including the Post Office, are especially busy during the Christmas Season. I recommend changing the time frame for mailing Christmas invites from the usual six to eight weeks to eight to ten weeks before your wedding. If you're still having trouble finding exactly what you desire, contact me and I will help you find more Christmas wedding invitations.